MXP is the new AiM dashlogger designed to acquire and display data coming from your ECU, the internal accelerometer and gyro, as well as from the GPS08 Module included in the kit, analog/digital inputs and predefined math channels. 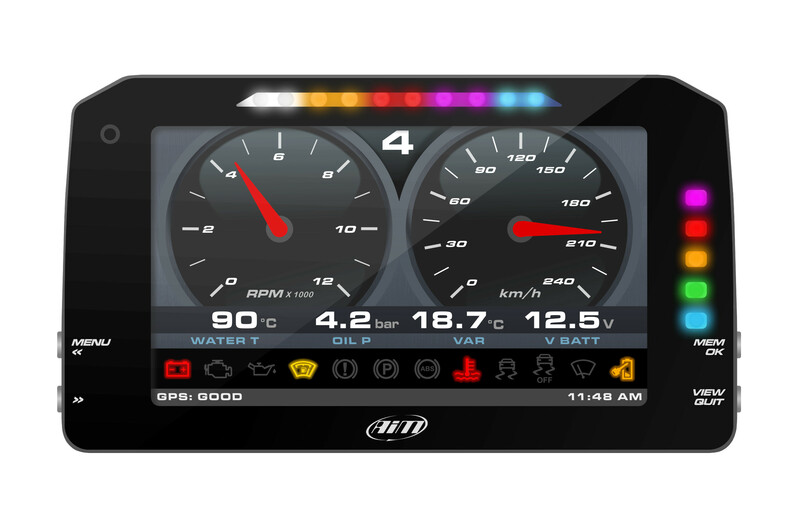 Its 6" display has been specifically designed for small cockpits installation. A high contrast TFT display identifies MXP at the first glance. You can define all the custom pages you wish, choosing among a wide library of page styles, defining which data to be shown, their end of scale and measure units. Swapping between pages can be managed pushing one or two pushbuttons. MXP features five configurable RGB alarm LEDs: you choose the conditions, you choose the colors. MXP features two digital outputs. The two digital outputs (Dout) are LOW SIDE type (switch to ground): they can be configured in order to be turned on/off depending on the value of the analog or digital inputs. Thanks to GPS08 Module and Race Studio 3 software, you can immediately get laptimes and all data needed for engine tuning as well as for improving driving technique. It permits to add 4 0-5Volt analog channels. It adds 4 K thermocouples. Wide band Lambda controller LCU-One, with Bosch LSU 4.9 probe, providing all Air/Fuel data, lambda value and exhaust gas temperature, allows to perfectly tune the carburetion. The on-board cameras that overlays on videos the data sampled by your logger. The Memory Module is a small SD Card holder that can be connected via CAN bus to your AiM logger in order to record the data during your tests. With Race Studio 3 you can also analyse all data recorded by MXP and downloaded to your PC: graphs, histograms and tables will help you study your performance, providing an objective support to avoid mistakes and improve performances.